Mythic Russia also now available in hardcover! After a few days of very encouraging sales as well as comment in the online fora, the core Mythic Russia book is now also available in crisply-printed, robust hardcover format – otherwise, exactly the same contents as the softback. You’ll find it listed as an additional option on the Firebird’s storefront page on Lulu.com. 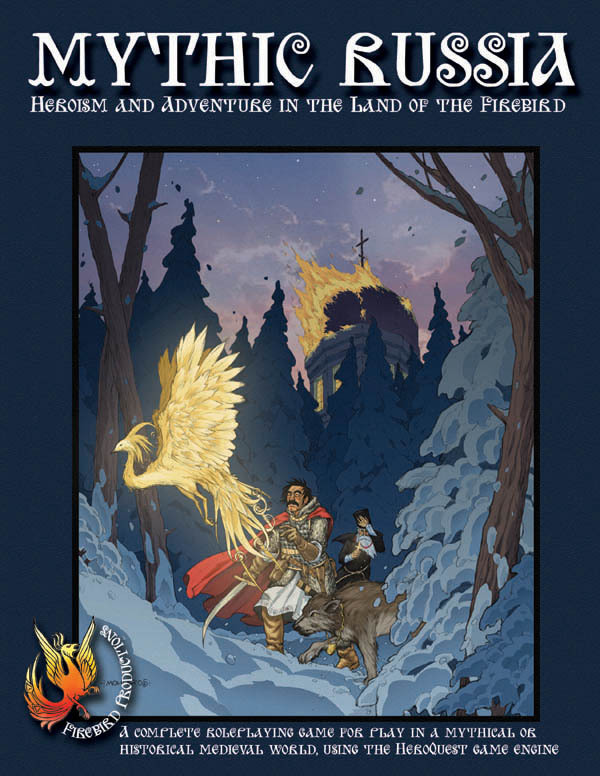 The core rulebook of Mythic Russia is back in print, available through Lulu! It is also for the first time sold as a PDF ebook for those looking to save paper and/or money. New print edition of Mythic Russia coming soon! Very soon, the Mythic Russia core rulebook will be available from Lulu.com as either a PDF or hardcopy (both an initial softback and then hardcover versions). I’m awaiting a test print and assuming all is fine with that, hope to be able to make an announcement around 15 June. After almost two years out of print, it will be great for me to see it available again.